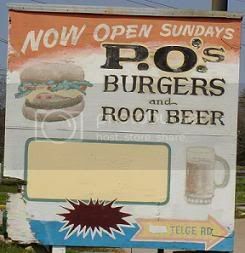 Over the years I have lived in Houston, I have made many a trip to PO's to get my burger fix. It helps that it is only a short 5 minute drive from my house. I almost feel like PO's is my hometown burger joint. Every time I go to PO's - I enjoy the experience. They have good ol' handmade burgers. The restaurant itself is your textbook burger joint complete with picnic tables inside and outside the place. Nothing fancy here - just good company, great atmosphere, and great burgers!!! PO's 1/2 pounder is one single big meaty patty. 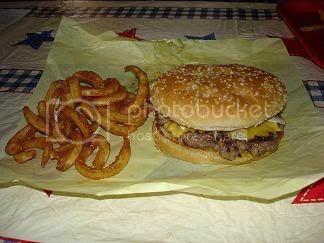 They don't do what some other burger joints do and pile on 2 1/4 patties - they just give it all to you in one big patty. I love that. The burger had pretty good flavor. Nothing really fancy about it. Doesn't taste like the marinade their meat in anything or add any special seasonings to it or anything like that. Seems like they just pack down a healthy portion of ground beef and throw her on the grill. While the patty had good flavor - the overall chemistry was a little messed up. I think whoever was running the mayonnaise that day we went was told they could go home after they used up all the mayo or something cause they piled it on. It was a bit much for my taste and it really overpowered the flavor of the meat too. My advice is to ask them to put it on the side or something like that. They also put mustard on the burger as well - so you get the mayo, mustard, vegetables, meat, and bun flavors all mixed together. The chemistry has to be just right and it was a bit off with my burger. Great burger! A 2 hander but not need to ask for help from anybody else to help you with this burger. It is "handleable" by one person only. The burger above was $4.19. I left PO's feeling pretty full - but not $4.19 full. For 4 bucks I better leave there wishing I had ordered a smaller burger. That wasn't the case. 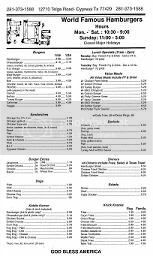 PO's does have lunch specials on Monday and Tuesday. On Tuesday, if you buy french fries anda drink - the 1/2 pounder is half off which is a good deal. PO's has a great selection on their menu. (see picture below) They have some pretty wild choices when it comes to burgers. For example, you can get yourself an Ostrich, Buffalo, or Turkey burger!!!! I haven't tried either one but I bet they are good. A good friend of mine told me the Hot-Bob is a must have if you like fire in your mouth. They add jalapenos to the meat. He said it was a pretty messy burger. They also have a Veggie burger which in my opinion isn't a burger at all. If it is made of anything but meat - it belongs in the salad section of the menu - not the burger section. We tried the 1/4 pound cheeseburger, grilled chicken sandwich, cajun fries, tator tots, onion rings, and waffle fries. (not all in this one trip) All are good. Tator tots and regular fries are very plain. The cajun fries and o-rings are definitely worth the money. All in all - you won't be disappointed with many menu items at PO's. PO's atmosphere is one of your typical mom and pop burger joint. Not many frills and fancy stuff here.. Just plain ol' mom and pop burger joint. They have picnic tables on the porch as you enter. That is a great place to sit when the weather is just right outside. On the inside - you will find more picnic tables as well as some regular tables. Note the full roll of paper towels on each table. I love that. It tells you they know their burgers are greasy and messy and you're gonna need some napkins. There are 2 TV's. One near the bar area and one in the far right part of the restaurant. You got around to the left to order at the counter. The person taking your order will yell out your order so be sure and order your wimpy veggie burger when there is nobody around, k? Overall PO's has a good hometown feel to it. You rub shoulders with the other people in the restuaurant. When PO's is real busy - you might find yourself sharing a picnic table with some new friends. Trust me - you'll enjoy the atmosphere at PO's. PO's is pretty easy to find. Exit Telge Road off 290. Follow Telge around for about 2 or 3 miles from 290. PO's will be on your right. 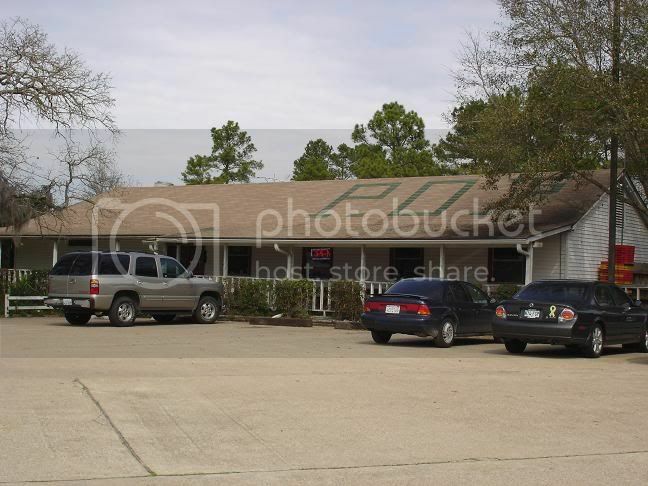 A great hometown atmosphere with friendly waitstaff awaits you at PO's. It is no wonder that I have gone back to PO's so many times over the years. They simply have a great tasting burger in a perfect mom and pop burger joints atmosphere. Do yourself a favor and give PO's a try. 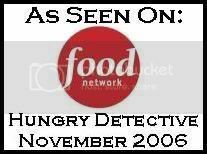 I've eaten there a number of times and have never been disappointed. There is no atmosphere to speak of, but the food has always been very good. The bufallo burger is excellent -- it tastes like beef and is leaner than chicken. P.O's is the greatest burger joint in Texas!! You HAVE to try this place, the burgers are juicy, the fries are hot and the beer is cold... what the hell else is there? What year were you born and were you born at Methodist? Because I think we were seperated at birth. 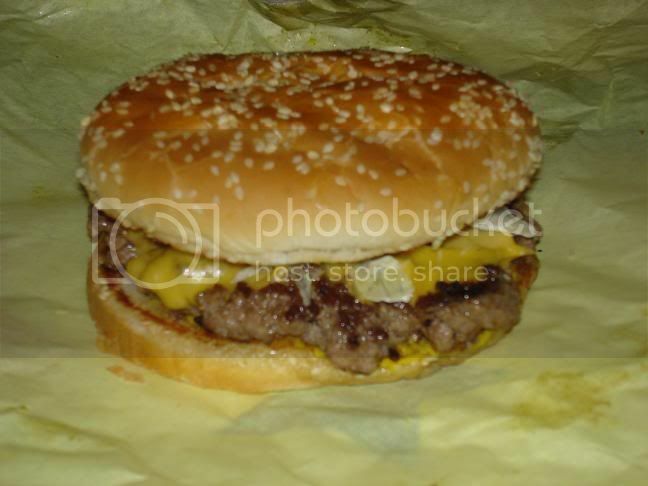 God love you for the pics of greasy burger tissue clothing. It's my primary judgement factor. Looking forward to your reviews of Lunch at Sams....I birthed a 9.5 pound daughter and it was all their fault due to proximity of my work at the time. Haven't been there in eons though. Great thing you have here! POs does make some dang good burgers. Cypress, Texas may not be the little cow town it used to be, but when you're at POs, it's like stepping back in time. A place where you and your Ag buddies go after school (or skip out for lunch!) eat some good burgers, shoot some pool, and flirt with the pretty girl behind the counter! by the way, POs is suspected to be haunted. 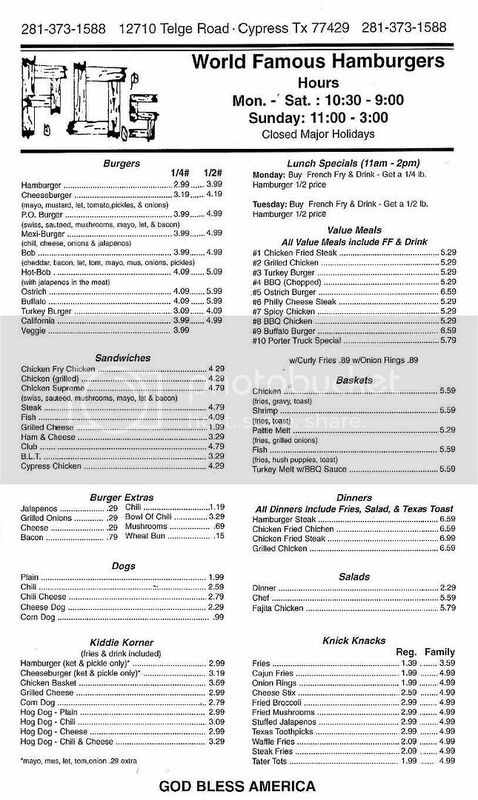 i happen to have family that literally lives 2 minutes from P.O's and i must say that we go to eat there on ever single visit to Houston. I love the burgers, but there other options are wonderful as well. its defnitely worth going to, and bring the family. We LOVE this place! POs is at least a monthly stop for us! Great burgers & the philly cheesesteak is really good also! If you are in the mood for a good old fashion burger make the drive out to Cypress! This is an OK restaurant. The burgers are just OK. They aren't great or really good. They are over rated by many. There really aren't any great burger places in Cypress, so it's all relative. Service is nothing special. You order your food, and pay up front. They have a tip jar by the register. I dislike this practice. Why would I pay a tip for food and service before the meal? Personally, I've eaten at Po's about five times because they are close by and I was too lazy to drive further. But I won't do so again because the food is only fair, and I dislike the implications of a tip jar where you pay upfront. As for the service. They call your name when the meal is ready, and you come an get it at the counter. You fill your own drink at the station. So, you really are your own service. Nothing wrong with that though. However, the last time I was there, they were out of tea. The counter guy said he would bring some more, and asked me to hand him the tea canister/dispenser. I did and later he brought it back to the counter, and asked me to put it back. OK, not a lot of work, and I did it. But then, I'm the customer, not the employee. I just didn't really feel like there was much service ethic there. And yet, they have a tip jar. For what? Now for those who think I'm cheap and don't like to tip. Sorry, that won't fly. I do tip when there is service and it's good service. As for the decor, it is casual and rustic. This is probably Po's best feature. It is a pretty cool setting to relax and chat over a burger. They have a TV mounted on one of the walls, and tables out on the front porch. It seems to be frequently patronized by local little league sports teams as well. At least, I've seen coaches with their teams maybe 3 out of my 5 visits. Well, that's it. I'd like to really like Po's, but in the end, I find it to be nothing really special with lackluster service. Too bad, because I've lived in some locations which have those really special old fashioned burgers and fries. But Po's don't make that cut. Reading some of the other reviews, you'll see comments about these being really great, old fashioned Texas burgers. All I have to say to these folks is, you've never had the real thing. Seriously, you haven't. Po's is better than a fast food burger, but not by much. Lately, I have notice certain changes in POs. I have to say that whatever they are doing they need to keep it up! 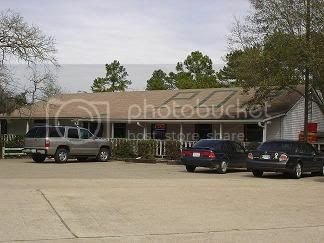 The Staff is friendlier, The food is still GREAT, and it's looking alot more cleaner in there! I went in there a few weeks ago for dinner and was completely shocked at how nice the service was i gave the young lady at the counter a tip and told her that I am a burger expert and i will be back for more! improved since that Susie girl started working there. That girl earns her money, she is a hard worker and always has a smile on her face.